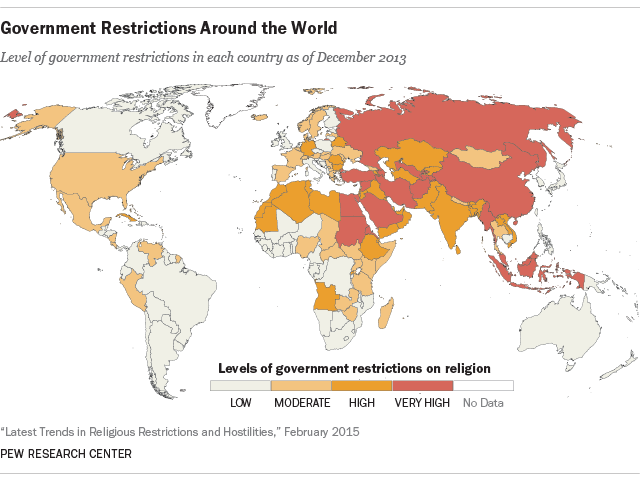 The median level of government restrictions on religion increased in two of the five regions (Asia-Pacific and sub-Saharan Africa) and decreased in two regions (Middle East-North Africa and Europe). It stayed the same in the Americas. In the latest year studied, the Middle East and North Africa continued to have the highest median level of government restrictions. The median score on the Government Restrictions Index for the 20 countries in the region decreased slightly, from 6.2 in 2012 to 6.0 in 2013, but it remained much higher than the global median (2.4). Many government restrictions present in the region in past years continued to occur in 2013. For example, government limits on public preaching were reported in 17 of the 20 countries, the same as in 2012. Similarly, government interference with worship occurred in 19 of the 20 – unchanged since 2012. In Europe, the median score on the GRI went from 2.6 in 2012 to 2.5 in 2013, remaining slightly above the global median. Decreases in government restrictions within the region included fewer limits on foreign missionaries and fewer reports of government harassment or intimidation of religious groups. The Americas’ median score on the GRI stayed the same in 2012 (at 1.5), considerably below the global median. Sub-Saharan Africa’s median score on the SHI fell from 2.1 in 2012 to 1.3 in 2013, slightly below the global median (1.6). Sectarian violence and attempts to enforce religious norms were reported in fewer countries in the region in 2013 than in 2012, with one notable exception. In the Central African Republic, conflict between predominantly Muslim rebels and Christian vigilante groups led to multiple types of religious hostilities into the country, including: sectarian violence; attempts by organized groups to dominate public life with their perspective on religion; religious groups attempting to prevent other groups from operating; hostilities over conversions; and mass civilian displacement.29 Collectively, these hostilities contributed to a significant increase in the level of social hostilities in the Central African Republic, whose score on the SHI rose from 4.5 in 2012 to 7.6 in 2013. In the Asia-Pacific region, the median score on the SHI decreased from 2.9 in 2012 to 2.2 in 2013, but it remained above the global median. 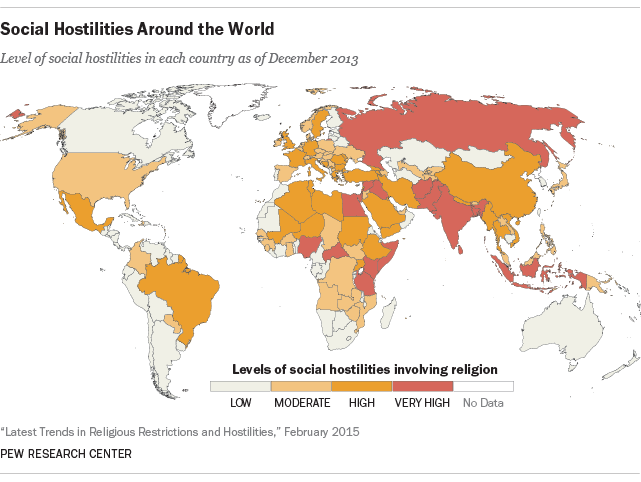 Factors contributing to the decrease included a decline in hostilities related to proselytizing, which was reported in 13 of the 50 countries in the region in 2013, down from 18 countries in 2012. There also was a decrease in the number of countries in the region where religious groups attempted to prevent other groups from operating. Europe’s median score on the SHI declined slightly, from 2.7 in 2012 to 2.3 in 2013, but it remained above the global median and many examples of social hostilities involved religious minorities (see sidebar for more details). The median level of social hostilities in the Americas remained low, dropping to 0.1 in 2013 from 0.4 in 2012.